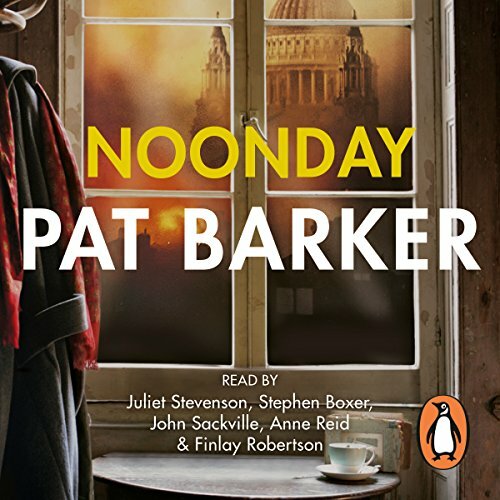 Penguin presents the unabridged, downloadable audiobook edition of Noonday by Pat Barker, read by Juliet Stevenson, Stephen Boxer, John Sackville, Anne Reid & Finlay Robertson. London, the Blitz, autumn 1940. Ambulance drivers Elinor Brooke and Kit Neville ferry injured survivors from bomb sites to hospitals while Elinor's husband, Paul, works as an air-raid warden. Once fellow students at the Slade School of Fine Art, before the First World War destroyed the hopes of their generation, now all three find themselves caught in another war. And as the bombing intensifies, old loves and obsessions resurface until Elinor is brought face to face with an almost impossible choice. Completing the story of Elinor, Paul and Kit that began with Life Class and continued with Toby's Room, Noonday is both a standalone novel and the climax of a trilogy. Pat Barker brings the besieged and haunted city of London into electrifying life in her most powerful novel since the Regeneration trilogy. pat barker still has it. powerful evocation of a terrible history of london in the blitz.